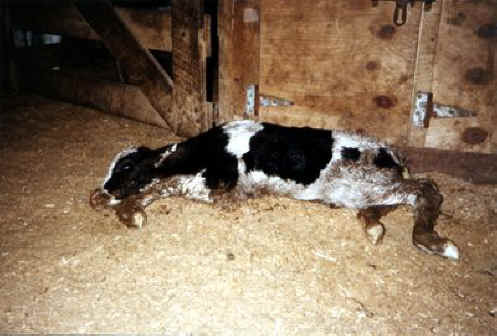 (Cattle Exploitation - Dairy - 10) This is Opie (whose picture is also in the left column) when he was left for dead at a New York stockyard. Opie's pregnant mother was taken to the stockyard and gave birth there. In this photo, Opie is only a few hours old, still wet from birth. His temperature was too low to read on the thermometer. 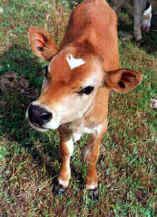 Opie was rescued and taken to Farm Sanctuary, but others are left to die.